We have reviewed The Bickley a couple of times already, but as they had just opened after being closed for renovation, I was itching to re-review them. I had tried calling them for a few days but wasn’t able to get through. So, in the end, I decided to pay them a visit the Saturday afternoon – I was told their phone was currently down. Not something I can blame them for – but he then said they didn’t have space! I could make 12pm, if that helps – we were squeezed in. This was only the second weekend open, and almost fully booked already! Due to the renovation, The Bickley had been overhauled, as well as being freshly decorated. They had opened the upstairs area (where we sat) – large windows allowed a lot of light in from the road. The tartan carpet, along with the sage green light and dark painted walls made the venue feel really pleasant. Claire sat on a large settee, me on comfortable chair and JW (our 17 month old) in a clean highchair. The table was laid out (with paper napkins and flowers). Overall, they had brought The Bickley up to a very comfortable, contemporary standard – I liked it immensely. There was also a large garden out the back with a children’s play area (aged 6 and up, I think). One thing I have to mention – every single place setting had a side plate and butter knife – but at no point throughout the meal were we (or anyone else, from what we noticed) were offered bread! 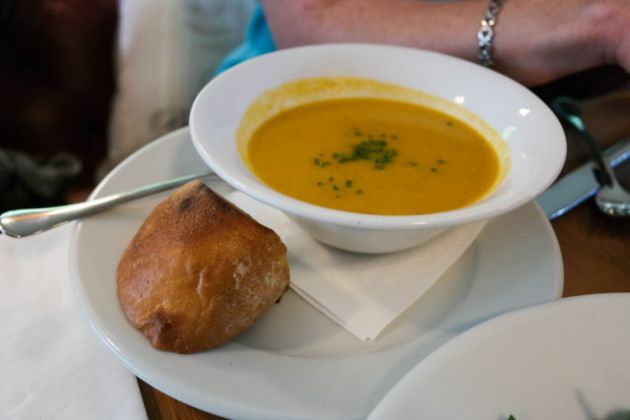 The starters were ok – Claire enjoyed the soup. 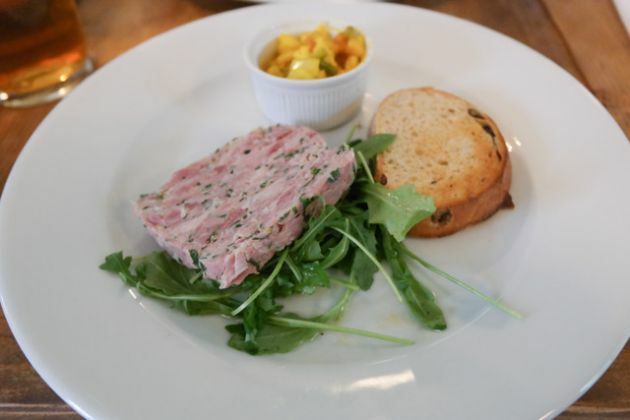 My terrine was nice, but I did feel that the single slice of toast / bread was just too small a serving for £5.50 (especially as I saw someone else’s come out with a couple of slices). 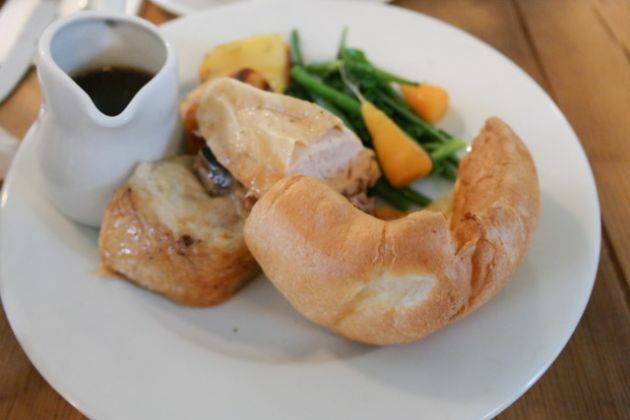 We ordered JW a child lunch – Roast Chicken. Claire asked for the Roast Pork, I requested Roast Beef (not asked how I would like it cooked). The roast beef was cooked medium to well, it was nice enough. I also had spicy red cabbage, four (!) roast potatoes, green beans, kale, carrots, along with a large Yorkshire pudding. So, overall, quite a lot of food. The roast potatoes looked great, but disappointingly, they were not crunchy at all. JW’s roast was actually very good value – a moist chicken breast, half a Yorkshire pudding, two roast potatoes, kale, green beans and carrots. 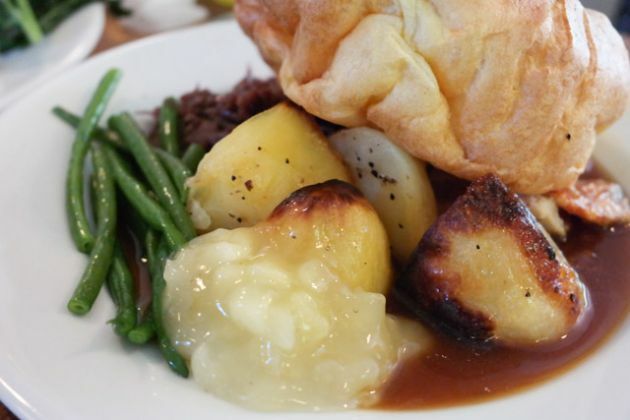 I had decided this was our last Sunday lunch review for a few months – so I just had to order dessert! 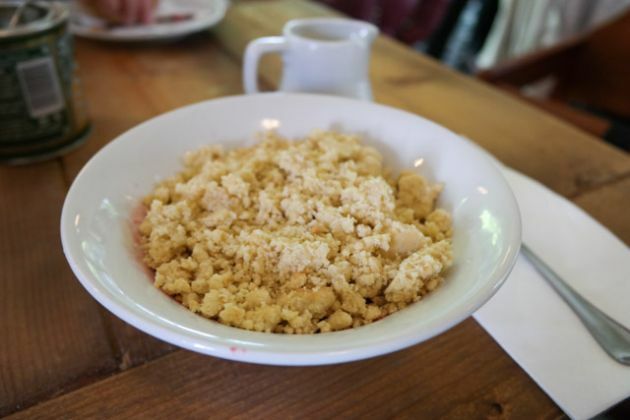 As previously I had a crumble, I was pleased to see rhubarb and apple was available (for £5.50) – dutifully ordered. 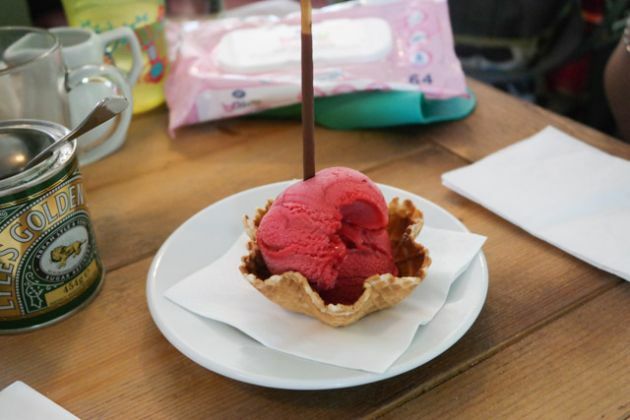 We also ordered JW the sorbet (£2.50). Dessert took a long while to come out – over half an hour which is not good with a 17 month old baby! Tucking in, the crumble was very nice, with a small jug of custard on the side. As in the previous review though, they definitely suffered from serving far too much. JW did enjoy the sorbet (he ate half and was helped by Claire with the other). 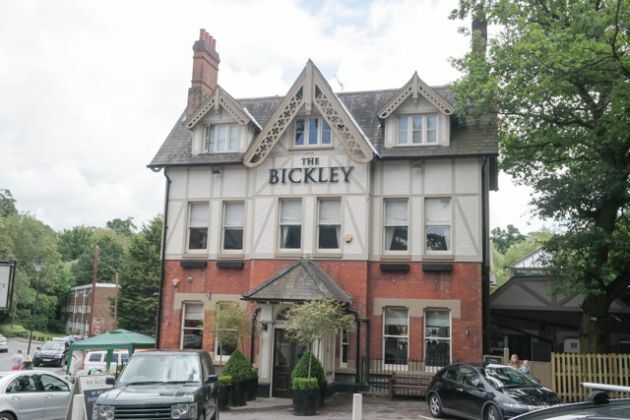 The owners of The Bickley are definitely looking to appeal to families in the area. The garden was a large size with a children’s area. 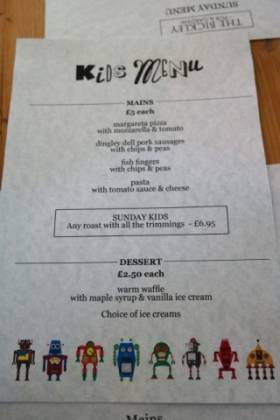 The kids menu was good, with 4 different options along with a Sunday Roast at £6.95. We didn’t need to use the children’s facilities, but I believe they had a changing area available. So, overall, a good place for children / families. I had very high hopes for The Bickley after the renovation. The building itself had definitely been improved, with a light coloured exterior (it was previously black). Inside, it was bright, airy and very large indeed. The garden had been put to better use with a children’s play area. Where I felt let down was the service – it was incredibly slow. The meal took almost 2 and half hours from start to finish, which was just too long with a toddler. 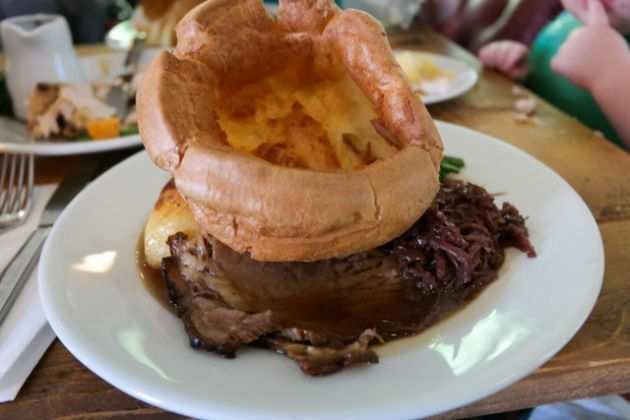 The food was ok – the roast potatoes were a bit of a disappointment. Also, the quality control was an issue – one small slice of toast with the hock, and no vegetables with Claire’s roast pork. I suppose these are the kind of problems which can happen with a new venue / team so I won’t be too harsh on them. A huge improvement though is the fact they serve beer by the pint (as mentioned previously, they only served by the bottle). Also, the meal was a bit cheaper, being £13ish for a roast instead of upwards of £15. Overall, a good venue for families – and I’d visit again for a drink at some point.